Can't have a game table because you don't have space? Just get rid of your dining room table and you'll have plenty of room! No seriously though. 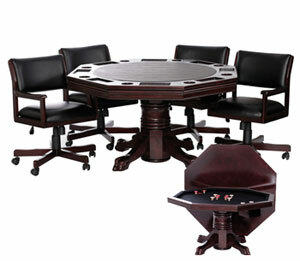 We carry beautiful dining room tables that convert into bumper pool tables and poker tables. We call it a 3 in 1 game table. For today's multi functional home you can truly make the most of your space with a 3 in 1 game table. Great for steak dinners, family games or even late night card games... no matter what the stakes, 3 in 1 game tables offer something for just about everyone and every occasion. The most popular 3 in 1 game tables offer bumper pool. Bumper pool is great for those that love to play pool but don't have room for a full size table. The bumpers add added obstacles and challenges that make playing on a small table fun for all skill levels. Angled shots and clever ball placement make bumper pool a game both challenging and fun. Now you can get a bumper pool table and a dining room table at the same time! To complement bumper pool, three in one tables can also feature poker tables, air hockey tables, rulet tables and more. More interactive than video games and more practical than any other beautiful piece of furniture, the 3 and 1 game table is a good investment for any home. Imagine the surprise when you start dealing a game of poker on what looks like any standard kitchen or dining table. It never gets old! For more information on 3 in 1 bumper pool tables or traditional bumper pool tables visit the experts at www.bumper-pool-tables.com. We've played them all and can answer any questions you may have about equipment or rules. Let us help you find the best possible game table for your home.